The vote to impeach President Dilma Rousseff means that the political situation in Brazil is not going to improve any time soon. One of the luxuries of being an academic is the freedom to step back from the fray of partisan politics to dream a bit about how the world should be, not how it actually is, mired in the muck of daily events. In some ways this is the only way to cope with the seemingly intractable mess that is contemporary Brazilian politics. The most recent episode in a saga now being dramatised for a Netflix series was the Sunday 17 April vote by the Chamber of Deputies to impeach President Dilma Rousseff. 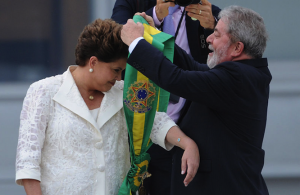 In formal terms Dilma was impeached for fiscal impropriety, which simply means she engaged in some creative accounting in 2014 to make the Brazilian economy look better than it was during her re-election campaign. While larger in scale than normal, this was not the first time such acts have been perpetrated by a Brazilian president, state governor or mayor. Indeed, just about any democratically elected head of government seeking to extend their tenure is quite familiar with this sort of strategy. More to the point, it is not clear that what Dilma did was actually a “crime of responsibility”, which is the formal criteria for impeaching a president. Brazil’s Supreme Court has yet to give a clear interpretation about what the nebulous language in the constitution surrounding impeachment actually means, a task the Court may well continue trying to avoid as Dilma moves towards a trial in the Senate. In her defence Rousseff argued she should not have been impeached for what amounts to an administrative fault tacitly permitted under the existing legal regime. If you were under the impression that Dilma was impeached for corruption instead of the somewhat fuzzier idea of fiscal impropriety you stand in good company with most of the Chamber of Deputies. It was not until the 81st vote was cast last Sunday that a Deputy correctly identified the “crime” they were judging amongst their cries of “for Jesus”, “for my nephew”, “for Brazil”, and even “for Colonel Brilhante Ustra” (who tortured Dilma in 1973). Almost all of the deputies seeking Dilma’s ouster accused her of corruption with some directly linking her to the Lava Jato investigation of malfeasance in Petrobras contracting. Aside from the handful that abstained, almost no one on either side of the aisle directly addressed the formal charge against her. In a forceful speech delivered on Monday Dilma took umbrage with the tone used by legislators during the vote. Noting that the Chamber of Deputies has every right to impeach a president, Dilma pointed out not only that she has yet to be mentioned in any of the documentation or testimony in the Lava Jato investigation, but also that her government has done everything it can to create the space for an empowered independent judiciary to investigate corrupt linkages between the country’s political and economic elite. The collateral damage she has suffered in this respect is quite considerable, losing six ministers to corruption charges during her first year in office alone. It is at this point that we and many of our colleagues start to lose hope that the political situation in Brazil is going to improve any time soon. While legal in a strict sense, the debates attached to the impeachment process have almost nothing to do with the substance of the formal charges. The real game is political: one designed to charge, try and convict Dilma of corruption in a partisan political court built on a foundation of self-serving privilege and entitlement widely separated from any clear lines of accountability to the electorate. In this sense the real problem facing Brazil is not the purported (and very real) malfeasance of the Workers’ Party in power, but the very nature of the Brazilian political system and its interlinkages with economic elites. The quickest way to highlight the structural problems facing Brazilian politics is to take a closer look at Dilma’s political “prosecutors” and “jury”. The driving force behind the impeachment process is Eduardo Cunha, president of the Chamber of Deputies and third in line for the presidency. While rumours of an attempt to depose Dilma have been swirling since the polls closed in the 2014 presidential election, it was mostly just a lot of hot air from frustrated supporters of failed presidential candidate Aecio Neves. Matters changed quickly in late 2015 when Cunha decided impeachment might be a good idea after the Workers’ Party not only refused to support his candidacy for President of the Chamber of Deputies, but also backed away from a motion in the Chamber’s Ethics Committee that would have protected him from expulsion on charges of corruption, bribery, money laundering and electoral malfeasance. As it stands Switzerland has an open investigation against Cunha and there is a process pending in the Ethics Committee about some $40 million in illegal payments he has allegedly received. If we spread our gaze a bit wider the picture only gets worse. Over 299 of the 513 members of the Chamber of Deputies are either being investigated, are facing trial, or are among the 76 who have been convicted of serious crimes. Many of these crimes involve active corruption and abuse of political office. Although we could go on to catalogue the charges against the Deputies who voted in favour of impeachment, such an exercise would be as depressing as it sounds and would take far too long: the magazine Piauí published a detailed summary of the convictions and charges pending against pro-impeachment deputies in a 41-page spreadsheet. Even the possible chief beneficiary of the whole impeachment process – Vice-President Michel Temer – is firmly established on the list of suspect individuals, a matter bluntly emphasised when he was named as the beneficiary of a fraudulent bioethanol scheme detailed in a plea bargain by still-sitting senator Delcidio do Amaral. Revelations from the Panama Papers and a continuing stream of Lava Jato plea bargains only deepen the quagmire, leading many Brazilians to view pretty much the entirety of Congress as indelibly corrupt. This public disquiet appears to be well justified. Documents uncovered in the Lava Jato investigation include a spreadsheet kept by the construction company Odebrecht detailing over 20 years of bribes paid to politicians, many of whom voted to impeach Dilma. The larger point here is that the heated rhetoric in Brazil about the impeachment process being a coup is starting to look as if it has missed its mark. About half of the members of Brazilian Congress know they are under investigation and can feel the prosecutorial noose tightening around their necks. This fear is only heightened by the Lava Jato conviction and jailing of some of Brazil’s richest businessmen: men who were previously thought untouchable. The idea of the whole impeachment exercise as an elaborate jailbreak engineered by Cunha and his cabal in an effort to stay of out prison seems increasingly plausible. Not even a week has gone by and Brazil’s newspapers are already speculating on the various pathways that Cunha’s acolytes might travel to ensure their impunity in the face of a refreshingly muscular and independent judiciary. The most obvious route mapped out is for Temer as president to change the various officials overseeing the investigations in the Justice Ministry and the Federal Police. A parallel path would be managed by Cunha in the Chamber of Deputies to rejig the legal structure to further defang crusading judges such as Lava Jato lead Sergio Morro. Perhaps recognising this as a very real and pressing danger for Brazilian democracy, a group of senators has proposed a special presidential election during the November municipal elections to “reset” the system and find a way out of the current morass. Dilma Rousseff receives the presidential sash from Luiz Inacio Lula de Silva on 1 January 2011. Photo source: Fabio Rodrigues Pozzebom (Wikimedia). Creative Commons. The chances of Dilma surviving these political machinations and finishing out her term in 2018 are even worse than the Socceroos making it to the elimination stage of the World Cup tournament that year, which is to say not impossible, but nevertheless unlikely. Special elections to choose a new, “legitimate” president thus seem like an attractive option, but one that would ultimately make little difference because it would do virtually nothing to address the representative problems in Congress. There are important factors to consider here. Members of Congress have immunity from criminal prosecution unless expelled by the Ethics Committee or through direct intervention from the Supreme Court (STF), which is struggling under the inundation of corruption cases attached to Lava Jato. Normally the STF would deal with three criminal processes per year, but currently has 45 underway with an additional 15 awaiting action. This means that so long as an individual can retain their elected position, in practical terms they need not fear prosecution by federal or state-level law enforcement. The obvious central concern for almost half of the legislators relying on congressional privilege to maintain their liberty is ensuring re-election. Here the quirks of Brazilian electoral law are critical. Members of the Chamber of Deputies are elected through open-list d’Hondt proportional representation system. Citizens can vote either for a specific candidate or simply for the party of their choice. Votes cast for a specific individual are consequently also “pooled” with general votes for the party and then used to determine the proportional distribution of deputies for the district. Thus, anybody high enough on the list for a major party is guaranteed re-election irrespective of the electorate’s opinion of them. For someone like Eduardo Cunha – a key member of the PMDB leadership in Congress – this is a virtual get-out-of-jail-free card. While there are exceptions such as clown-turned politician Tiririca, this also means that the vast majority of Deputies have little direct accountability to the electorate and remain more dependent on party apparatchiks for their continued privilege than tight links to their local constituency. The result is that most deputies gain their position through the party list, with less than 10 per cent winning office through votes cast specifically for them. Voters consequently have little idea of whom they have elected since about 90 per cent of the representatives in the Chamber of Deputies rode their party’s name to Brasília. In short, it is a system where a voter cannot identify their representative and a deputy need not be concerned with direct accountability to a specific electorate. 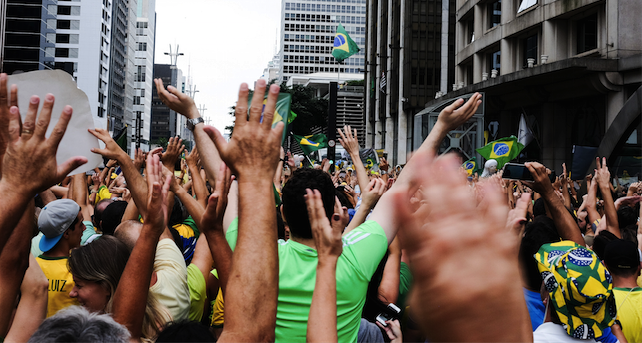 As the worsening political crisis in Brazil makes clear, the system is proving non-functional. Matters are further complicated when we turn our attention to how electoral campaigns are financed. Brazil is one of the most expensive electoral environments in the world, which creates an unresolvable contradiction when you consider that most of the country’s citizens have neither the money nor the time to give to political parties. Public funding, individual donations and corporate contributions within the bounds of the electoral law do not come close to funding the nationwide campaigns of the major parties, which is partly what precipitated the corruption scandal at Petrobras. But the problem is deeper. Many of the deputies who declared “yes” to impeachment dedicated their vote to their families, listing all of the elected offices held by brothers, sisters, nieces, nephews, uncles and spouses. In many cases running for political office is a family business, one that more than recompenses the costs of contesting an election. If you play the game properly and stay faithful to a “king” like Cunha, you and your family’s future is all but guaranteed. This is where we, as scholars and analysts, begin to get terribly depressed. Perhaps the single biggest sticking point in Brazil’s political crisis is the remarkable lack of accountability that deputies have to their electorate despite the country being a fully functional, vibrant democracy. Worse, the only way that the system can be changed is for the Chamber of Deputies to consider and pass a constitutional amendment, which requires a two-thirds majority on two separate votes. Most observers think that this is a lot to ask of the current Congress, particularly given the slowness with which the Ethics Committee and Supreme Court are dealing with the extensive backlog of corruption cases before them. We agree with Jose Padilla, director of the blockbuster social commentary films like Elite Force and the forthcoming Netflix Brazilian political drama, that Brazilian politics is currently an exceptionally dirty street fight that is only likely to get considerably worse before it can get better. But, begging some inspiration from Capitão Nascimento’s epiphany in Padilla’s film Elite Force II and taking some licence from an academic’s responsibility to “think outside the box”, we have dreamed up a way forward. Dilma is probably finished. Certainly, Michel Temer is acting like she is, sending his own “diplomatic” missions to Washington to sell his own narrative and recording de facto inauguration speeches intended for a small coterie of PMDB insiders. He is doing all this despite the clear message from the Brazilian public that as much as they may disdain Dilma, Temer is not considered to be any better. Elevation to the presidency will thus almost certainly return us to the cycle of protest and political instability, not least because Temer himself is facing impeachment charges in Congress that will almost certainly fail. (Nevertheless, Cunha is reportedly dangling the threat of impeachment over Temer’s head like a Damoclean sword in an attempt to control the vice-president.) Dealing with Brazil’s crisis may thus require desperately idealistic measures. We propose a three-step plan. First, Temer, or any other legitimate occupant of the Planalto Presidential Palace, should be clear they will not be running for re-election in 2018 and will devote all of their efforts to running a government of national unity. To do this they must commit to appointing the best and most qualified individuals to cabinet irrespective of their party ties or even experience in Congress. Second, they must commit to advancing deep and meaningful political reform, which we submit should be built around the anti-dictatorship protest cry “Diretas Já”, or “direct elections now” – fixing the abyssal distortion in Brazil’s proportional electoral system for the Chamber of Deputies. Where the protests in 1982 were calling for direct presidential elections, the current mess in Congress rather suggests that the same principle should be applied to the Chamber of Deputies. Finally, this leader should commit to a comprehensive overhaul of the country’s tax and regulatory system. This last task is clearly impossible in two years, but a national unity government would have enough time to get the process indelibly in motion and leave voters with clear choices between different options in the 2018 presidential ballot. Of course, our dreams from the ivory tower are unlikely to ever see the light of day. First of all, pursuing this plan would require a selfless statesman, the sort of individual who has been notably absent throughout the entire impeachment odyssey. As our critics will quickly point out, there is also the problem that the current Congress would likely never agree to the second element of our proposal. Indeed, Cunha has made it crystal clear that he will allow no legislation to pass through the Chamber of Deputies until the Senate has tried and convicted Dilma, bluntly stating: “in the coming weeks the Government will not be recognised by the House.” In effect, we are calling on a president appointed by Congress to play a game of high stakes chicken with the legislature, asking the country’s elected representatives to publicly declare if they are really interested in serving the people or just themselves. Perhaps the cynic in us would be proven wrong and Congress would cooperate. Failing that, the deepening of the crisis forecast by Padilla would be accelerated, hopefully speeding Brazil to an eventual resolution. Either way, we feel our proposal is a step forward because it looks to a positive exit from the current game of self-immolation. Amongst the recriminations and acrimony of Brazil’s contemporary political debate very few are putting forward visions of hope and reform. 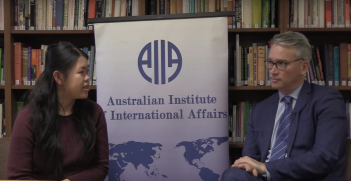 Dr Sean Burges is a Senior Lecturer in International Relations and Deputy Director of the Australian National Centre for Latin American Studies at the Australian National University. Dr Fabricio H Chagas Bastos is a Lecturer in International Relations at the Australian National University and Assistant Professor of International Relations with the Universidad de los Andes in Colombia. This article is published under a Creative Commons Licence. It may be republished with attribution. The US president is a symptom, not the cause, of the broader problems surrounding the deterioration of the liberal international order. 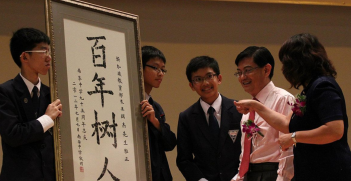 The likely election of Heng Swee Keat as Singapore’s fourth prime minister will cement consultative authoritarianism as Singapore’s mode of governance. In 2017's changing maritime security environment, the 50th anniversary of ASEAN saw the group hold its first multilateral naval exercise. 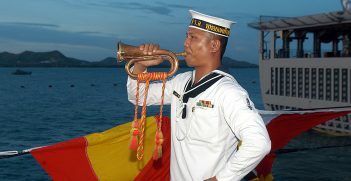 So what is the naval potential of its diverse membership?